SI Kids put out their food-themed issue this month, where Ayesha Curry shared a recipe, Francisco Lindor talked of his mom's lasagna and other athletes revealed their favorite dishes. This piece originally appears in the August 2017 issue of SI Kids. Subscribe here. What's it like cooking for a two-time NBA MVP? Luckily for Steph Curry, his wife, Ayesha, is a gourmet chef who loves preparing food so much that she started a meal kit company, Homemade Kids. "Parmesan chicken tenders are so easy and delicious," Ayesha says. "Chicken Parmesan is one of Stephen's favorite meals for me to make. This version is a play on our family favorite, and our kids can join in on making it and have fun! It is served alongside the Game Day Pasta Sauce, where I sneak in delicious veggies to create a flavorful sauce. It's the perfect complement." • Line baking sheet with parchment paper. • Mix flour, salt, and pepper in the second bowl. Stir to combine. • Crack eggs into a bowl and lightly beat them. • Dip chicken first into flour, then egg mix, and then dredge in bread crumb mixture. Repeat with all the chicken. • Place coated chicken on prepared baking sheet. Cook for 15 to 20 minutes (turning halfway through) until golden brown and the juices run clear. • Heat the oil in a large skillet or Dutch oven, over medium heat. Add the onion, season with salt and pepper, and cook until softened, about three minutes. Add the garlic and cook for one more minute. • Add the eggplant and season with salt and pepper. Cook, stirring often, until the eggplant begins to soften, about three minutes. • Add the wine and bay leaves, increase the heat to medium-high, and cook until the wine has reduced by half, about five minutes. • Stir in tomato paste and cook for 30 seconds. Pour in the tomatoes and season with thyme, brown sugar, and one teaspoon kosher salt. • Cook, simmering gently over medium-low heat, until the tomatoes have thickened enough to lightly coat the back of a spoon, about five minutes. Be sure to crush the tomatoes with a wooden spoon if any large chunks remain. Fish out the bay leaves and discard. Francisco Lindor, Cleveland Indians: Lindor is a major league shortstop and a 23-year-old man. That doesn't mean he's too big for his mom's cooking. During the season, his mother, Maria, often visits his home in Cleveland. When Lindor returns from a road trip, she greets him with his favorite dish: homemade lasagna. Maria, who is from Puerto Rico, puts a Latin twist on the Italian meal. Among the seasonings she uses to flavor the meat are sofrito and adobo. And the dish includes three cheeses: white cheddar, mozzarella, and—here's the secret—cream cheese instead of the usual ricotta. "I love the way she makes it," Lindor says. "It's always huge whenever you spend time on the road and you come back and your mom is cooking for you." 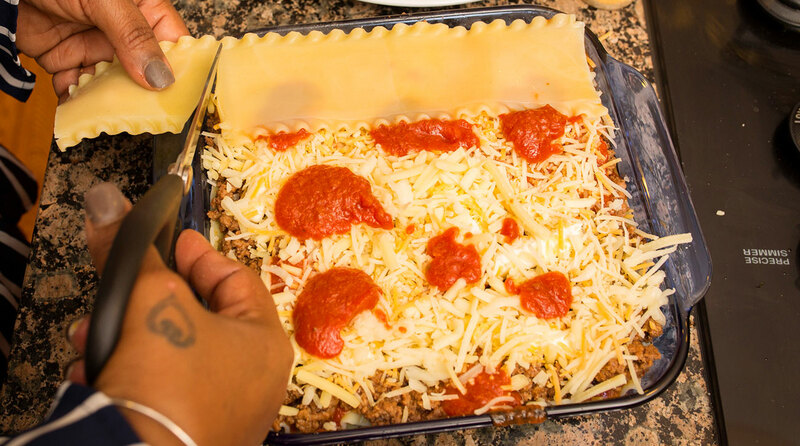 Francisco Lindor's mom makes her signature lasagna. Breanna Stewart, Seattle Storm: "My mom makes these chicken riggies that are off the chart. She usually makes it when I have a team over or my family gets together because it's a bigger dish. It's rigatoni noodles with chicken and a tomato sauce. She can add red pepper flakes to make it spicier. She puts diced tomatoes in it, and she can add peppers and all types of things. I made it for my team when I was at UConn because they'd had it before—my mom would bring me leftovers that she'd frozen, and the team came to my house one time and she made it. I don't want to say it was good as my mom's, but they all approved." Madison Keys, tennis player: "I really enjoy kale and have it often. I like to make kale chips for a healthy, crunchy snack. It makes kale seem less like a vegetable. Add a little salt and bake it for 10 to 15 minutes." Eric Kendricks, Vikings LB: "I used to hate drinking water, but now I can't live without it. I used to not drink water because it didn't taste like anything. I learned that other drinks are full of sugar and caused me to cramp during physical activity. Literally, your body can't survive without water, and it is healthy to stay hydrated. Drink up!" April Ross, Pro beach volleyball player and two-time Olympic medalist: "The weirdest food I ever ate was cow tongue, my sophomore year of high school for extra credit in Spanish class. I thought it was very meaty, but I wouldn't eat it again unless there was something in it for me." Dexter Fowler, Cardinals CF: "I'm obsessed with the yellowtail sashimi at Nobu. It's fresh; it's the right flavor. It's perfect. We probably get nine orders of it every time we go. It's usually just my wife and me, but my three-year-old daughter, Naya, goes too. Naya loves sushi."